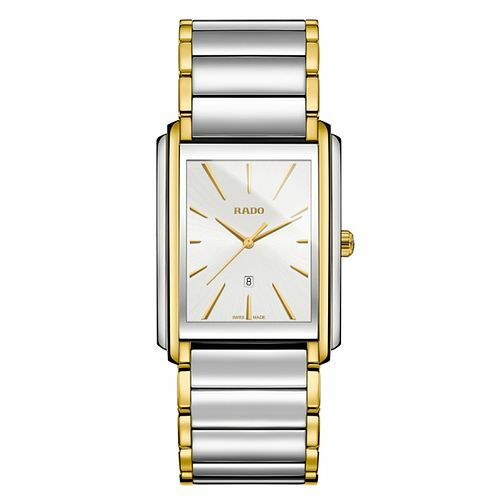 A smart and sophisticated two-tone men's timepiece brought to you by Rado. In a robust rectangle design in silver and gold tones, this classy colour combination presents a stylish case and co-ordinating bracelet. Bearing a crisp white dial, an understated gold tone display of hour markings and two matching hands are featured. This swiss made watch is an ideal staple for any smart and stylish man. Rado Integral Men's Two-Tone Bracelet Watch is rated 4.5 out of 5 by 2. Rated 5 out of 5 by Anonymous from Goegeous watch Really lovely looking watch, we bought the matching ladies as well good price and they look really classy, as always, excellent products and prices with Ernest Jones. Rated 4 out of 5 by Anonymous from Nice watch I purchased in the sale at a very good price. It is very nice but I returned it as the face was too large for my wrist. It would suit a man with a thick wrist.